Romilly's HART and Fieldbus Web Site: What is HART? Copyright © Romilly Bowden 1997, 2009. HART ("Highway Addressable Remote Transducer") is a popular digital communication protocol designed for industrial process measurement applications. The original and still most widely used version is the frequency shift keyed ("FSK") version. The special feature of this is that it uses a low-level modulation superimposed on the standard 4-to-20 mA current loop which has been widely used for such measurements. Because the HART signal is small, and composed of sine waves, its average value is zero and does not significantly affect the accuracy of the analogue current signal, which can therefore still be used. This provides compatibility with existing systems, while allowing simultaneous digital communication for device configuration, status checking, diagnostics and so forth. Later specifications cover a higher-speed 9600 bps option, and HART rev. 7 includes WirelessHART™, which offers high-speed short-range radio network functions using the 2.4GHz ISM band. The preamble, of between 5 and 20 bytes of hex FF (all 1's), helps the receiver to synchronise to the character stream. The start character may have one of several values, indicating the type of message: master to slave, slave to master, or burst message from slave; also the address format: short frame or long frame. Since HART rev. 6, it also indicates the number of bytes in the "expansion" field (see below). 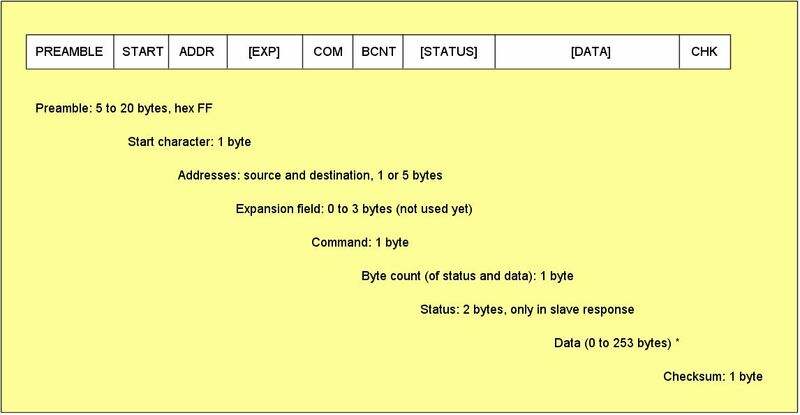 The expansion field allows for up to 3 additional bytes to be inserted between the address and command fields. The number of bytes present will be indicated by bits 6 and 5 in the start delimiter. Use of this feature, introduced in HART rev. 6, is as yet undefined. The command byte contains the HART command for this message. Universal commands are in the range 0 to 30; common practice commands are in the range 32 to 126; device-specific commands are in the range 128 to 253. HART rev. 6 introduced 16-bit "extended commands" for device family commands. These put 31 (hex 1f) in this byte, and the 2-byte command number as the first 2 bytes in the "data" field. The status field (also known as the "response code") is two bytes, only present in the response message from a slave. It contains information about communication errors in the outgoing message, the status of the received command, and the status of the device itself. The data field may or may not be present, depending on the particular command. Universal and common-practice commands use up to 33 bytes of data, keeping the overall message duration reasonable. (But some devices have device-specific commands using longer data fields.) See also the HART data field. Finally, the checksum byte contains an "exclusive-or" or "longitudinal parity" of all previous bytes (from the start character onwards). Together with the parity bit attached to each byte, this is used to detect communication errors. Using HART digital communication, up to four measurements (or more) can be transmitted in a single message. Multivariable instruments have been developed to take advantage of this. In addition, when using only digital communication, several instruments can be connected in parallel "multidrop" on a single pair of wires (with their analogue currents each set to a minimum value, usually 4 mA). Each device has its own address, so a host can communicate with each one in turn. HART was developed by Rosemount Inc in the mid-1980's, but has been made completely open, and all rights now belong to the independent HART Communication Foundation, which supports the protocol and oversees further development. There are now upward of 200 member companies in the HCF, most of whom have HART products on the market. Virtually all measurement types are available, also valve positioners. A number of DCSs and PLCs provide HART-compatible inputs, so they can check device status, and read multiple measurements from a single field instrument. You can find out more about the technology and available products from the HCF website, or ask your favourite instrument supplier. There is also a technical overview booklet, available from the HCF.